Looks and sounds delicious… and a great substitute for rice and pasta for diabetics! I will make stir fry this weekend which I believe is Chinese New Year. Thank you for the recipe! OMG!!!!!! This was delicious !!!!! My husband loved it . We shared it with our neighbors who are vegetarian. They also thought it was amazing. I used a orange glaze with the veggies. This absolutely a do again dish. I’ve tried other cauliflower rice recipes with little success; hopefully this one is a winner! The first recipe I tried was for raw cauliflower rice in a sauce made with nutritional yeast and I was definitely not a fan. 🙂 Then I tried it again cooked and loved it! This was absolutely delicious! I used a orange glaze on the veggies. This is absolutely a do again recipe. Also, I love cauliflower rice! It’s true, it’s no match for the taste of rice, but it’ll soak up any saucy dish adequately. Sounds delicious! I also love cauliflower pizza. The only thing I would change is don’t cook with olive oil. Olive oil is not healthy for cooking because it oxidizes. It is better to use olive oil for things like salad dressing, where you are not heating it up. The only reason Olive oil oxidizes is if it is at too high of a heat. I use it all the time to fry and stir fry. Loved it! I am trying to eat healthier and loose weight and this recipe is great! I love white rice, but will start making this with my stir fry veggies. Thanks for this recipe. Looking forward to.trying more recipes. You do! 😀 I am totally a volume eater, so I love stuff like this. Cauliflower is next on my list of things to start liking. The smell when cooking though BIG GAG! As a diabetic, rice is a big “no-no.” This looks like a doable alternative. Thanks to a friend for posting this on Facebook. Good tips! 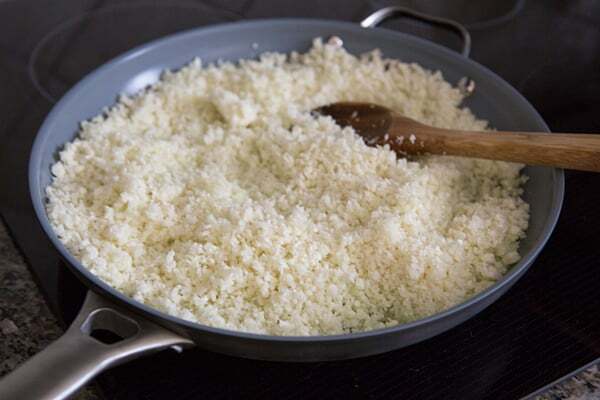 I usually think of cauliflower rice as something you would eat raw as a salad base, so I wonder how it would taste sauteed. I agree that it would be best as a substitute for couscous rather than rice too. Beautiful picture of the whole head of cauliflower btw! Yeah, I always thought cauliflower rice was supposed to be raw too, and I really hated it! 🙂 I like it much better now that I cook it! 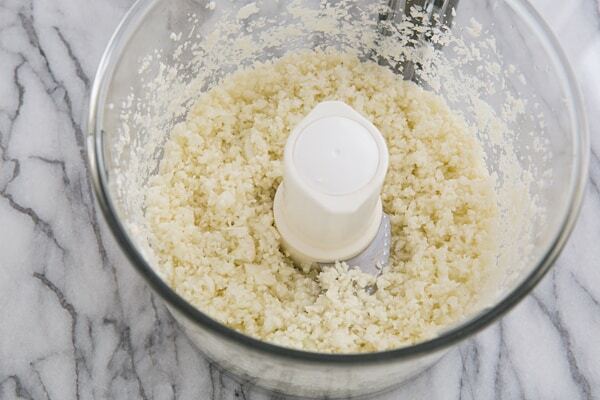 Great tips for making cauliflower rice! Thank you! I have been waiting to try this but our cauliflowers have been a ridiculous price for such a tiny head, have you perhaps tried it with frozen cauliflower? I think it would be difficult to achieve the right texture with frozen cauliflower. If you try it, let me know how it turns out! It is nice to have the opportunity for some many choices these days! I have made cauliflower potatoes but can’t wait for the rice! I hear my food processor calling my name! I. Love. This. I am making it tonight! If it comes out looking a-okay should I take a picture of it and send it to you? It’s much better than you’d expect, isn’t it? 🙂 I’m glad you liked it! Any salt-free seasoning would work. Mrs. Dash has a wide variety of blends that could be used with this, depending on what you’re serving the cauliflower rice with (use a blend with Mexican flavors for Mexican food, Italian flavors for Italian food, etc.). Funny! I like cauliflower raw! Not cooked! I have tried… mashed fauxtatoes – loaded and plain, roasted cauliflower, etc. I think it just gets a strong, funky taste when cooked. I have NEVER thought to eat the cauliflower rice raw!!!!! I am not sure why… other than all the recipes say to cook it. Hey! I’m compliant! What can I say? I think I might give it a whirl. Thanks for the idea! Hi. First, I just want to say how much I like your blog. 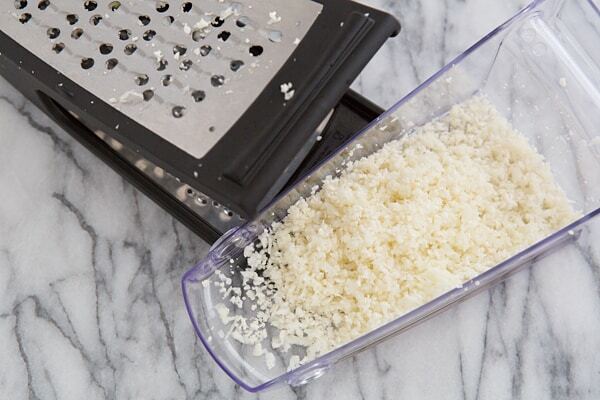 Second, could you use a potato ricer in place of a grater or food processor. I know this sounds crazy but I have a potato ricer that I have used maybe twice and it kills me that I paid for something that’s slowly gathering dust 🙂 I need more work for my potato ricer! Well, thank you! And I’m not sure about the potato ricer. I think you’d have to steam the cauliflower florets first, or they’d be too hard to push through. (Although, full disclosure, I have pretty weak hands, so it could just be me.) And if you steam them first, I’d worry that they might come out kind of mushy. So I think I’d steam them for as little time as possible–as soon as they’re the least bit tender, take the florets out of the steamer and rinse them with cold water. Let them dry well, then put them through the ricer. After that, you can sauté them in a skillet. If you give it a try, let me know how it works! These recipes sound great, but a head of cauliflower never lasts long enough around me to use in a recipe. I usually steam it and eat the whole thing!!! Love it! I am thrilled to have found you! I just recently started a mostly vegan diet. I just made this and the roasted chickpeas in prep for the burritos this week. Wow! I hope the chickpeas last, I can’t stop snacking on them. This rice is delicious! I ended up adding a little tomato paste, paprika and lime juice at the end for a bit of Mexican flare. Thank your Facebook updates, I have come to eagerly await them. I look forward to making many more of your recipes! Thank you for your comment and kind words about Oh My Veggies! 😀 And you will love the burritos–we test each other’s recipes before they’re published, so I tried the burritos and they were definitely the best I’ve ever had. A serving of rice is 1/2 cup but you would expect to have 3 servings of carbohydrates in your evening meal, so you can have 1.5 cups, which is probably enough for eating with curry. 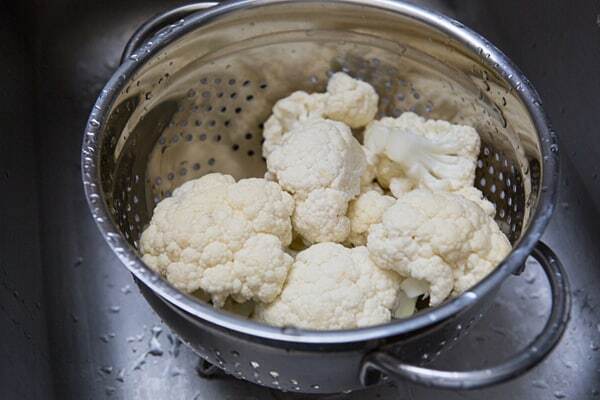 Cauliflower, as a watery vegetable, is in a different category but it has so few calories you might be having a snack an hour later. Hi! 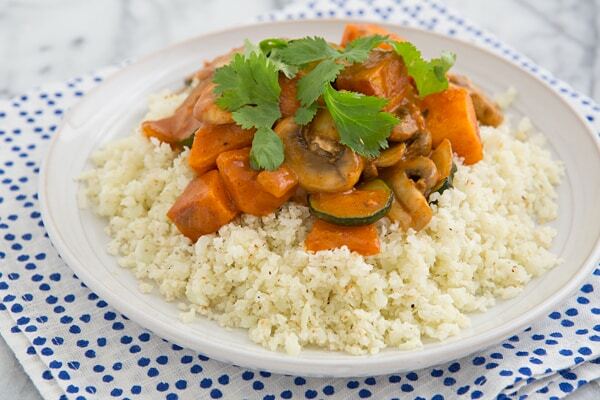 Going to try this out tonight as I’ve just started a grain-free diet and need something to bulk out a veggie red thai curry… Just wondering if you’ve posted the recipe anywhere for the curry photographed with the cauliflower in this post? It looks really nice! Also I feel like I should apologise because I’ve been loving your blog and making your recipes for a long time but don’t think I’ve ever commented before – so sorry for that!